Beijing is absolutely gorgeous right now. The days are sunny and warm. Jeans and a t-shirt are perfect. Pollution levels are low and the air clear… I see the mountains every day. Nights are cool and long, you definitely need a jacket. It is dark by 6. It is ideal weather for walking and I am tying to take advantage of it as much as possible as I know freezing cold is just around the corner. Chowder and I have been going for long hikes in the countryside (ish) near our house. 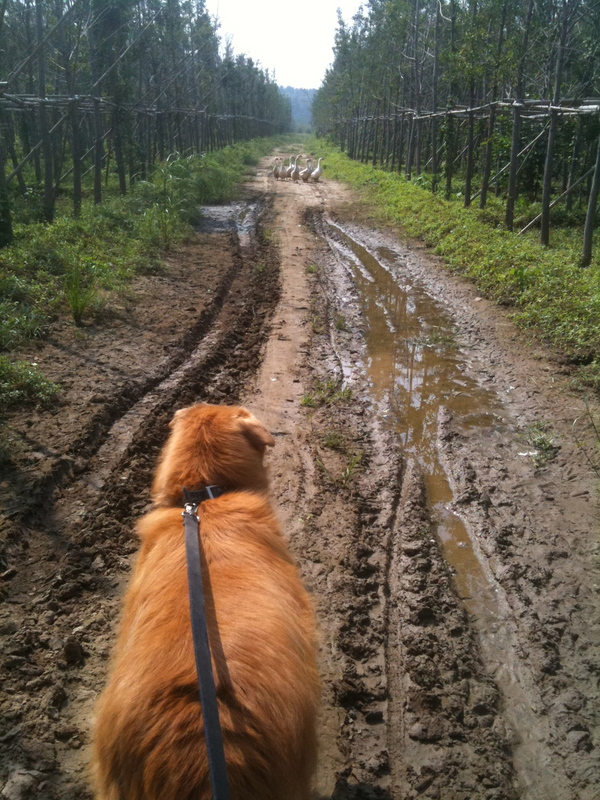 We love going through the fields that have just been harvested and along little dirt roads that lead to nowhere. I like getting off the pavement and he likes that I let him run off leash. He isn’t very courageous and usually stays quite close to me. I always “ni hao” the farmers, they usually look at me like I’m crazy and say “ni hao” back. I love every minute of it! Chowder and I were heading home after being out for a little over an hour. He was tired and I was hot. It had been a great walk. Everyday we either begin or end our adventure by strolling by a red house that always has kids, chickens and ducks in the yard. Chowder has always ignored them all. This morning he decided to change. He took off after the rooster, barking like mad. I yelled at him to come. He completely ignored me. The other chickens started squawking, the farm dog started howling, the ducks started quacking and the rooster was shrieking his head off, for about 2 minutes. For a couple seconds, until all hell broke loose. Eight people came running out of the house, holding small toddlers and screaming. My mind went blank; I forgot every single word of Chinese I had ever learned. They were yelling at me. They were sobbing. They were screeching and pointing at my dog. Chowder looked up from the field with a mouth full of feathers and grinned! The rooster was in bad shape! The farmers were furious and I was stunned! My big marshmallow of a dog had become Cujo. I tried desperately to find someone who could translate with the family. Finally my Swiss friend Lyliane picked up her phone. My Lady in shining armour. She spoke with the farmer and then rode her bike out to find me, bringing much needed cash… all I had on me was my ancient cell phone (which I had almost left it at home as it was nearly out of battery!). After much discussion, and lots of apologizing I handed over 200 rmb (About $30) and they handed me the dying bird. 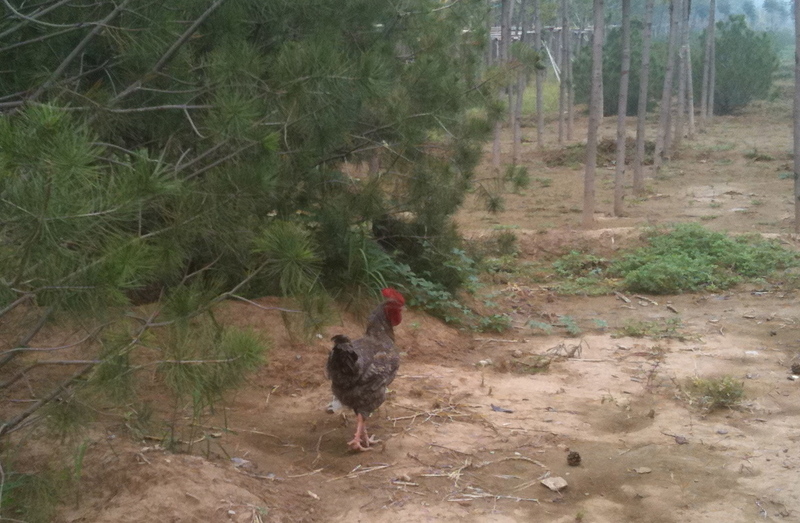 Bordering on hysterics, I begged them to kill the rooster (I had no idea how to wring its neck) and to please keep him. Guess I will need to call Patrick, the Beijing Dog Whisperer… his signs are everywhere.